We believe in providing up-front pricing for high-quality repairs that save you money! Joey's Auto Shop opened in April of 2012 by owner, Joey Tessman. The shop currently resides on the south side of Des Moines on County Line Road, not far from Blank Park Zoo. 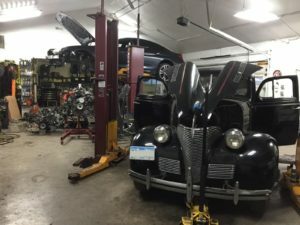 With an emphasis on quality repairs and customer satisfaction, the success of the shop has allowed expansion in 2019. We're not moving far! The new shop is conveniently located on Fleur Drive, directly across from the airport exit, allowing us to welcome visitors from around the globe to Des Moines. 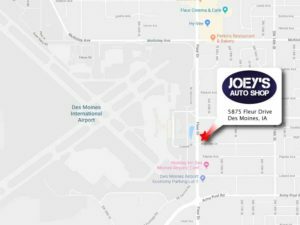 The new location gives Des Moines best auto mechanic more than 300% more space than the previous location to better serve our loyal customers - and of course, meet some new ones. If your car is in need of service, call, text, or message us or fill out this simple online form and we'll contact you to confirm our first available appointment. In our diagnostic phase, one of our certified technicians will evaluate your vehicle. Our objective is to address the primary concern(s) why your vehicle is here, first and foremost. We then provide an estimate and obtain your approval for the work necessary to complete a quality repair. After your approval, we start the repair. Duration of repairing depends on the labor involved, accessibility of parts, and our schedule. We will continue to keep you informed throughout the repair on timeframe involved. Joey's Auto Shop is proud to be a TECHNET Professional Automotive Service Facility. As a TECHNET Member, we are part of a nationwide network of independently owned shops who care about delivering exceptional service and customer care, meet a high standard of quality, offer and honor a nationwide warranty for at least 24 months/24,000 miles, and observe the highest industry standards. We are “The Elite Performance Network” with a common goal of being world-class automotive service facilities focused on quality maintenance and repair in the communities we serve. Our warranty is just one of the ways we strive to be Des Moines best auto mechanic. If your looking for a shop full of honest mechanics you can trust to fix your problems right the first time and for a fair price, this is it. Huge thanks to the Tessman family and Joey's Auto Shop! Had a great experience using this place! Joey was honest and actually made the the effort to show me personally the problems that were occurring on my vehicle. They also actually check into problems instead of just slapping everything new on when they might not be not needed. Price was very fair as well. Honest auto shops are hard to find but you will find that here! I took my Honda to Joey to replace the starter. The local Honda dealership wanted to charge me a huge amount for a refurbished starter. Joey was able to install a brand new starter with a 12 month warranty for a fraction of the cost. He was able to do the repair quickly. I am so thankful to Joey and will continue to go to his repair shop. Thanks Joey! Joey's Auto Shop was recommended by a friend years ago and now it is the only place we go. His prices are fair and he runs his shop with integrity. It's so nice to know a reliable and trustworthy mechanic. Copyright ©2019 Joey's Auto Shop. All rights reserved.